I've created this list of internet marketing tools because I find it incredibly difficult to keep up since new ones are constantly popping up. Social media and online marketing have opened so many doors for new companies to spring up and provide some added value. I try to update this list as often as possible to keep it fresh. FollowLiker – A powerful tool for growing your Twitter and Instagram accounts through a variety of methods. Safe and secure. HootSuite – Social media management and scheduling. Powerful. BufferApp – This software helps you schedule tweets and posts incredibly fast. The opposite of tedious and enjoyable to use. Needls – Identify sales leads though facebook and twitter. Klout – An interesting personal KPI tracking across your social reach and influence. Websta – An Instagram web viewer. Allows you to look up hash tags and their popularity. Iconosquare – Powerful iInstagram statistics and account management tool. Ritetag – Optimize your hash tags. Useful as it works cross-browser/platform. Tweetdeck – The best platform in my opinion if you have multiple accounts or hash tags to keep track of. Used it from day 1 and still do. Topsy – Search and analyze the social web. Search keywords and get relevant social news. Hashtagify.me – Hash tag data from Twitter. LongTailPro – A keyword research tool that I used from when I first started and still stands the test of time. Soolve – A unique keyword generator that generates similar searches on all the major search engines. Keywordtool.io – It gives you YouTube keyword suggestions for free. Ahrefs – Site explorer and backlink checker. Huge index of links. Know your backlike profile and your competitors. Open Site Explorer – A MOZ tool to review your backlink profile. SEMRush – Powerful data for SEM professionals, useful for developing and optimizing PPC campaigns. Indexification – Invite search engines to your site and boost rankings quicker. Quicksprout – Nice on-page analyzer and report tool. Aweber – The best email marketing tool there is. Amazing for list building, campaigns, autoresponders and maintaining any size of list. Zaxaa – The fastest solution to sell online, deliver digital products & recruit affiliate. BuzzSumo – Powerful influence + content marketing tool. I love this web app. NinjaOutreach – prospecting and outreach CRM, perfect to find the next best content idea and do content promotion to gain more brand exposure. Insane potential with this one. Pretty Links Pro – Link Cloaking and redirection. This is an amazing WordPress plugin! Free trial. Memberpress – Awesome easy-to-use WP plugin that turns any website into a membership site or ecomm site. Easy to setup products, subscriptions, trials, coupons and more. 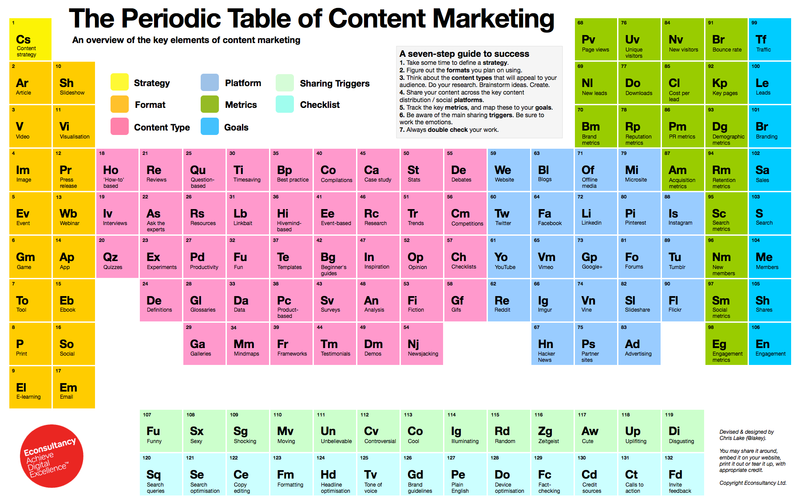 Periodic Table of Content Marketing – Amazing info-graphic to power up any content marketing strategy. SproutVideo – Awesome video host with solid features. Used them long time now. Canva – Design beautiful ‘feature' images for your blogs and social media marketing. I've only included links to services, products and internet marketing tools that I use on a regular basis. If you or your business would like help implementing these tools please do not hesitate to arrange a free 30-minute consultation and learn about how I can help you grow your social presence and online business revenue. If you have an internet marketing tool you think I should know about, leave a comment! My goal in life is to make content forever. Whatever that takes. I just want to tell stories and explore what life has to offer. I'm doing my best to document my craft here so other's can learn.